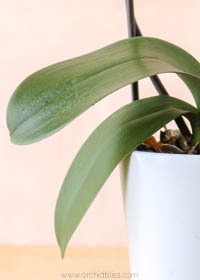 Keiki (KAY-key), Hawaiian for “baby” is the term for a new plantlet growing on a mother orchid. These plantlets can grow naturally and they can be encouraged by using plant hormones. 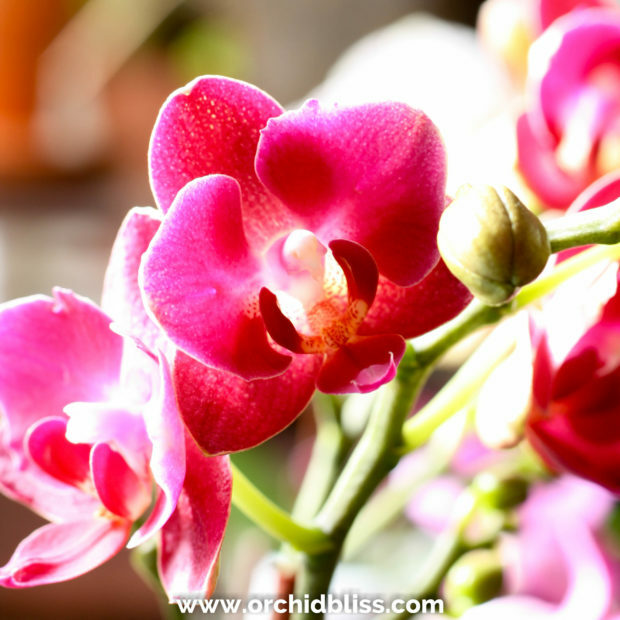 Phalaenopsis and Dendrobium orchids are especially prone to producing keikis. 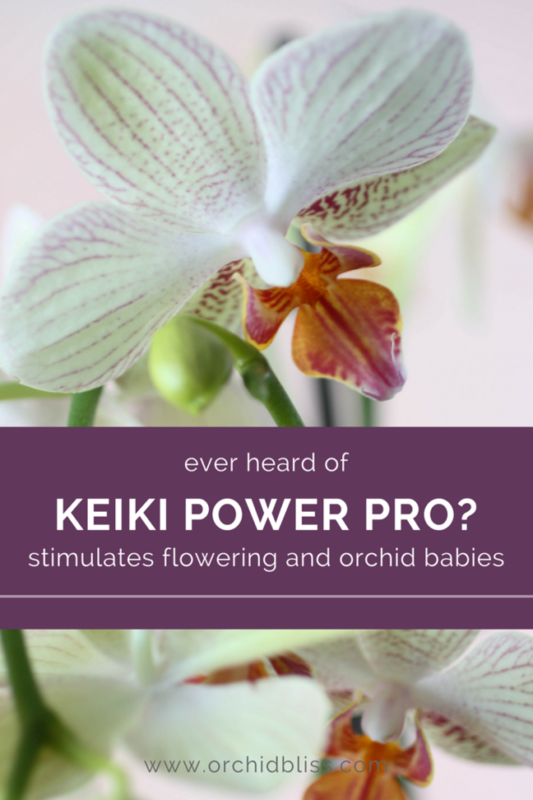 Let’s talk about what happens if your orchid has produced a keiki on its own, or how to encourage Keikis using Keiki Power Pro. Using hormones doesn’t always produce keikis, most often the orchid will produce flowers rather than a keiki–and that’s okay too. 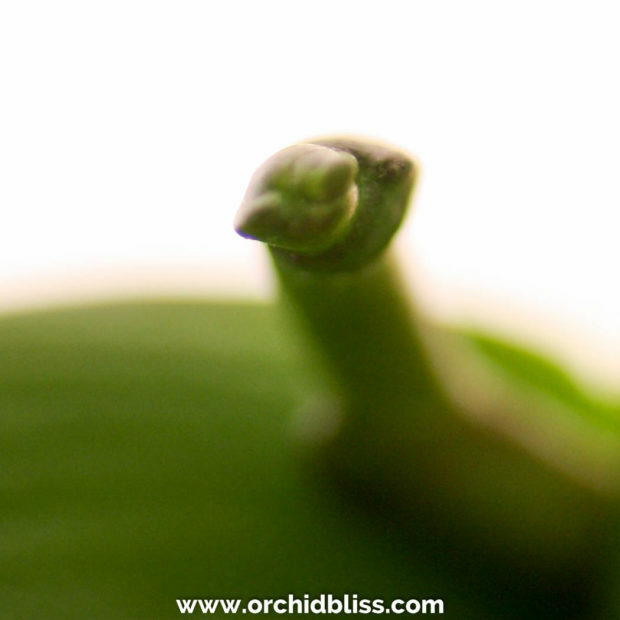 Your orchid may surprise you when one day you notice leaves and roots growing on your orchid’s flower stalk. This is one way that orchids propagate. The baby plantlet is a clone of the parent plant. 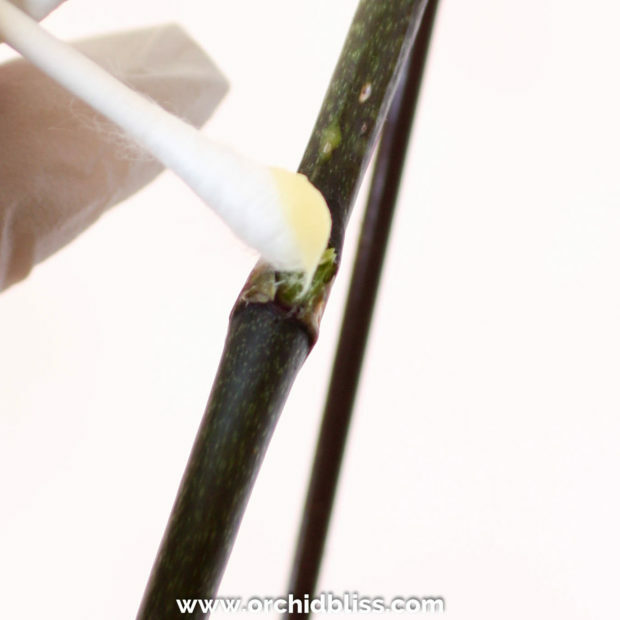 This type of propagation is most common in Phalaenopsis and Dendrobium orchids. If you do notice a keiki growing, look for sign of stress on the mother plant. Perhaps the root system is in trouble. Keikis are not always a sign that something is amiss, but it is something to be aware of. At any rate, leave the little plantlet alone until the roots and leaves are about 2-3 inches long. Then, with a new razor blade cut the keiki from the mother plant. Using a new, unused razor blade will prevent the spread of disease between plants. 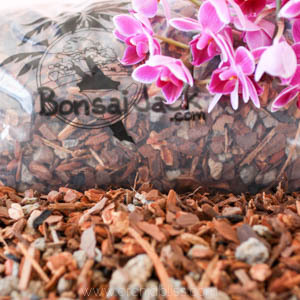 Using a potting medium designed especially for young orchids, pot the keiki in a small, clear orchid pot. Be gentle with your new keiki. If possible, provide extra humidity for your fledgling plant. Otherwise, care for your new plantlet as you do the mother plant. 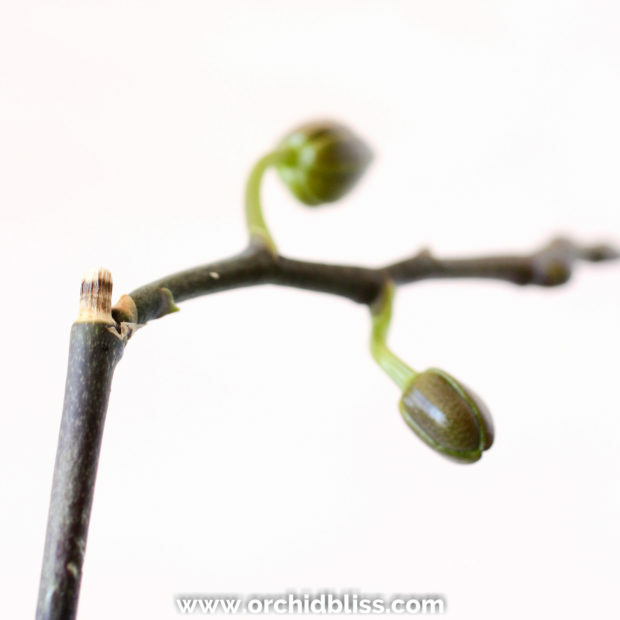 If your orchid hasn’t produced keikis on its own, or you want your orchid to produce more flowers, you can use hormones to kick-start your orchids. Keiki paste is marketed as a way to asexually produce more orchids. The question though is that when using the paste, you don’t know if you’ll get a plantlet or a flower stalk. My experience is that most of the time, the keiki paste results in a flower stalk, which I am totally fine with. In my experience, keiki paste works best with Phalaenopsis, or moth orchids (the kind most often found in the grocery store). Keiki paste contains a growth hormone called cytokinin that encourages cell division. 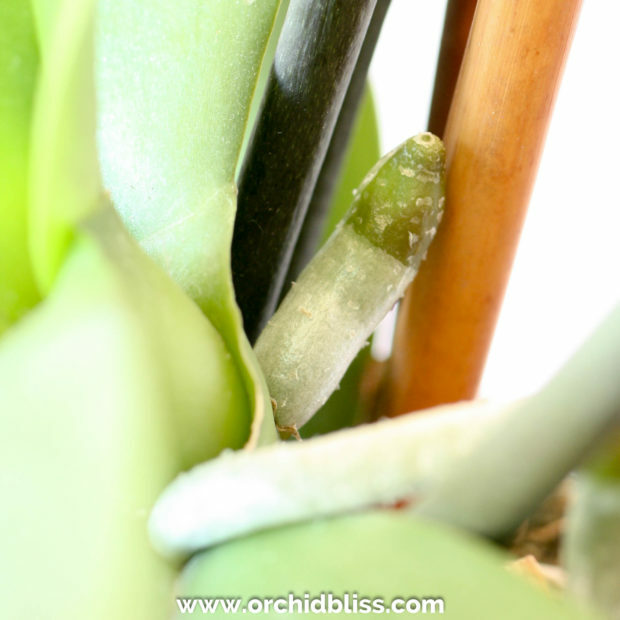 The hormone is added to lanolin because lanolin sticks to the orchid and won’t wash away if it gets wet. 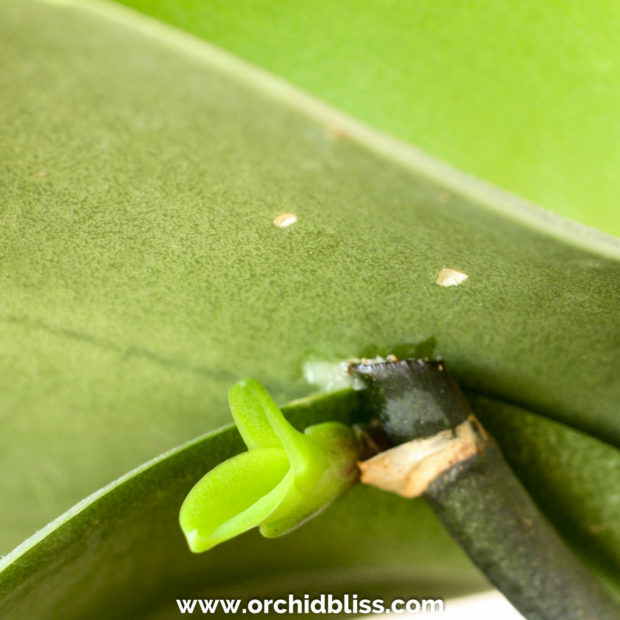 When the keiki paste is applied to an orchid node, the hormone will (hopefully, it doesn’t always work) result in either a keiki (an exact clone of the mother plant) or in an inflorescence (a flower stalk). I know, adding a bit of sticky goo to your orchid stalk with the hope of an emerging new orchid or a profusion of flowers sounds like wishful thinking, but I’m telling you, the stuff really works! Using keiki paste is SUPER EASY and a little goes a long way. 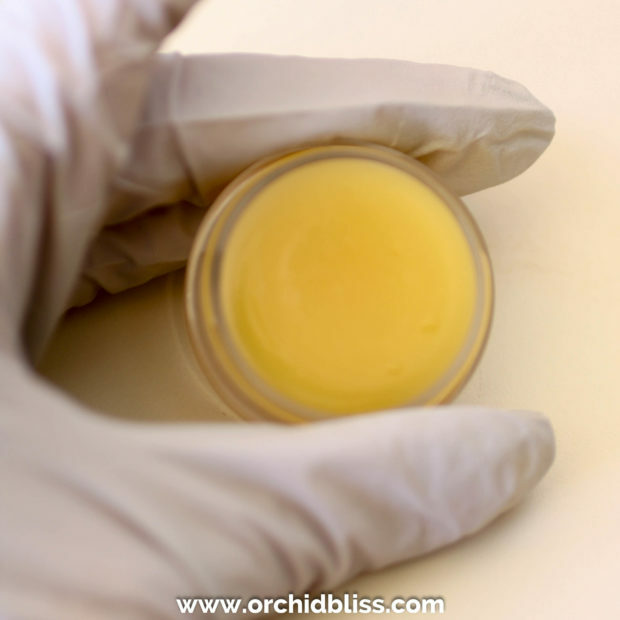 Once you buy the paste, the small jar will last for many, MANY applications. 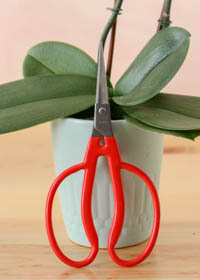 a sharp knife, utility knife or pruning shears to cut into the orchid node. A disposable utility knife is the most sanitary method. Begin by locating a “node” along the stalk. If you run your hand along the stalk you will feel a bump. The node will look like a little joint in the stalk. With a sterilized sharp knife, scissors, or utility knife, cut into the node. 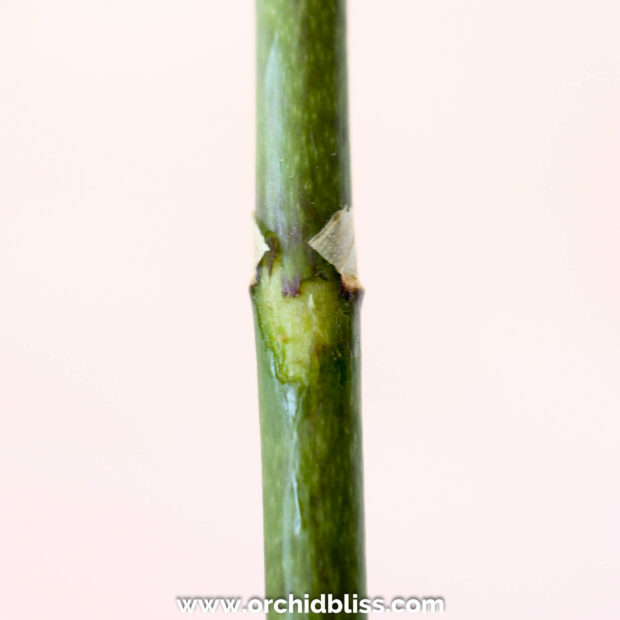 Take off enough of the node so the node is flush with the rest of the stalk. The orchid flower stalk is prepared for keiki paste application. Next, put on your gloves and with your chopstick or cotton swab, scoop out a very small amount of keiki paste. Finally, with the chopstick or cotton swab dab, a small amount of the keiki paste onto the prepared node. It’s good practice to record in your plant journal which orchid you applied the paste and the date. After applying the paste, I just kind of forget about it. Several weeks later you may notice a little flower stalk growing out of the node–sometimes at an odd angle. You will know it’s a flower stalk because the end will look like a closed fist with tiny bumps on the end. Pictured above is a flower stalk. If you see what resembles a closed fist at the tip, you know you’ve got a flower stalk. 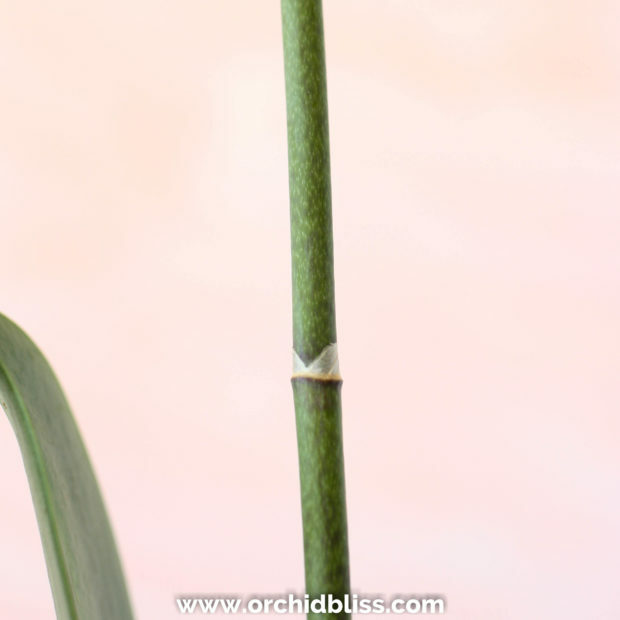 The smooth tip is a sure sign that this is a root, not a flower stalk. It looks a little funky where the new flower stalk emerges and where the dead flower stalk meet. 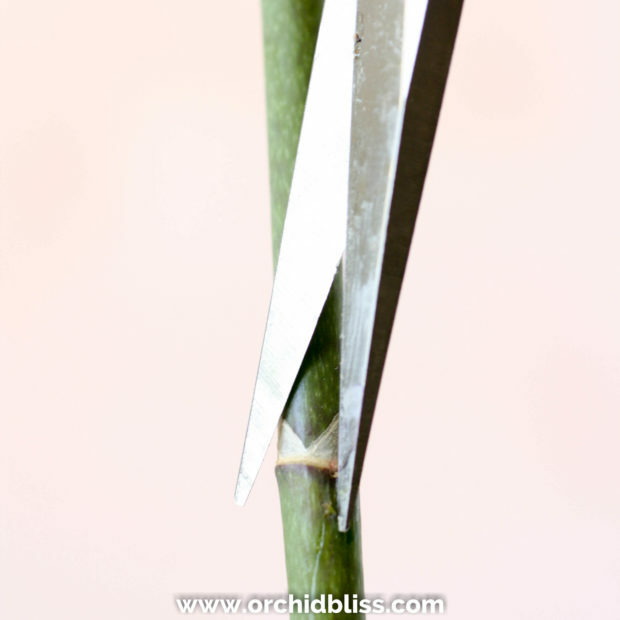 With a pair of sterilized scissors, trim off the remaining bump from the dead flower stalk. In most cases, you will see new flowers emerging. Or, you may be surprised to see little leaves emerging. These little leaves indicate that you’ve got a keiki, a perfect clone of the mother plant. Do not remove the baby plant until its roots are 1-3″ long. Rather than a new flower stalk, I was surprised to see this little keiki. 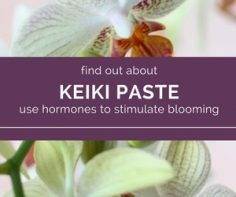 Keiki paste can result in an abundance of blooms. Although keiki paste is marketed for growing keikis, I’ve had more success encouraging more flowers. I have had limited success growing plantlets and robust success getting my Phalaenopsis to push out more flowers. And, I’m not the only one. Orchid distributors use it to get the most flowers possible. They know we’ll pass over the orchids with only a few flowers and gravitate to the plants packed with blooms. Excellent question. You must wait until you have a flower spike to use the keiki paste. Then make a small cut along one the bumps along the spike. Apply the paste to the cut. I’ve noticed that it works best on nodes that are closer to the tip of the spike than the nodes that are closer to the base of the plant. Can you apply keiki paste on several nodes on the same stalk or will that overwhelm the plant? Are you trying to get keikis or flowers? I’ve applied keiki paste on multiple nodes on the same stalk, but usually it’s only one node that eventually produces flowers. Phalaneopsis are tough plants, but if you’d like to err on the side of caution, just try one node. Keikis usually grow on orchids that are doing poorly. So if you’ve got a dying plant that you’re trying to get keikis to grow on, just try one node. Hope you get more flowers, or a keiki soon! I bought my keiki paste online at Amazon. I’m not sure what your buying options are. But don’t worry–even if you can’t get the keiki paste, you’ll still be able to bloom your orchids, it just may take a little more time. I wish I had a better answer for you. Were we can buy keiki paste in manila phil. I’m not sure where you can purchase keiki paste in the Philippians. I bought mine online at Amazon. Does anyone else know where keiki paste can be purchased? Thanks for reaching out. It’s always helpful when you know what kind of orchids you are growing, so thanks for that. 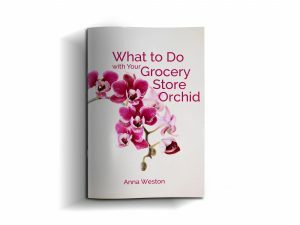 Let me know, Susy, if you have any more questions about blooming your orchids! This product really does work. You can try it anytime as long as there is a node on the flower stalk that you can slice into. I’ve had the most success applying the paste when the Phalaenopsis has just finished flowering. Expect flowers rather than keikis and you won’t be disappointed. Hi, Anna, I have a problem when I was not present my máma accidentally cut a Keiki, could you help me? Pot up your keiki. Use sphagnum moss as you can keep it moist. If you can raise the humidity level around your keiki, that would also be helpful. Keep the moss moist, but not soggy. What do you mean. Make a small cut along one the bumps along the spike. I haven’t heard this one before. I have always taken off the covering of the bud, before applying the Keiki paste. You can apply the paste between the leaves, for a flower spike. Thanks for sharing ways you use keiki paste! 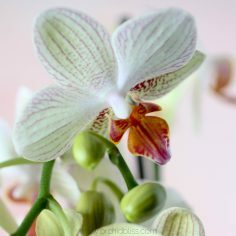 Do you use the paste just on phalaenopsis orchids, or have you tried is on others, such as dendrobiums? Yes, you can also apply keiki paste on a node along the flower spike. Anna, I’m wondering whether you’ve tried Danny’s suggestion of applying keiki paste between the leaves to grow new spikes. I just got my paste today and will try it on a few nodes and between the leaves to see what I get. Thanks for the article! Thanks for your comment. Leaving the keiki on the mother plant is a wonderful option. Keikis do not need to be removed from the mother plant and does increase the keiki’s chance of survival.